Applications can be submitted for any of these rounds by completing the online application form before the due date. Communications with the Mazda Foundation regarding your application. Saving and returning to your application. Internet Browsers to use while applying. Tracking your application: Once you have submitted your application, an email will be sent to you, so you may track its progress, add other users to your account, amend your details, and make more applications by using the applicant dashboard login at the top of the application tool bar above. 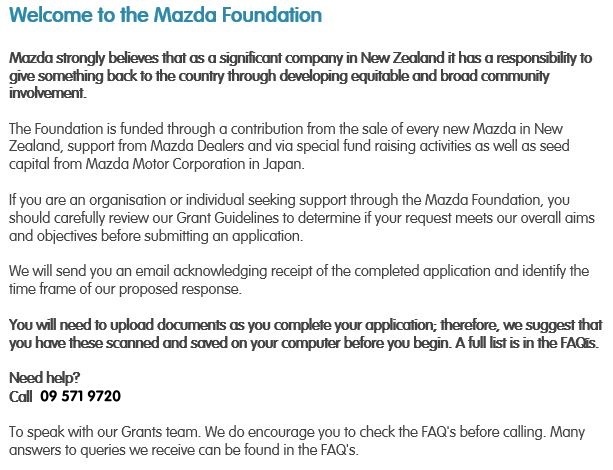 You must CLICK on the the MAZDA FOUNDATION GRANT button below to commence your application. Personal identification and uploads: In order to thoroughly check the suitability and authenticity of your application, you will be asked to provide the contact details of atleast one referee. You will also be asked to scan and upload a number of other documents (including a scanned copy of a New Zealand Driver License or Passport) in Step 5 and in the final step; Step 7 (a full list of these is available in the FAQ's under the 'Uploads' heading). Please complete below by entering your information as the person completing this application (you). Important Note: If you are applying as an Individual, please enter your postal address below. Is you project / activity in more than one location?